My thoughts on using energy saving remote sockets, these are available from many retailers ie maplins, Argos etc, aswell as the cheaper discount retailers like home bargains or B & M stores. I have just brought a pack of 3 from one of the discount stores for just £12. You can normally get them in different quantity’s of the sockets from 1 to 5 sockets, though they only come with one remote control. I have had several of these types of these remote sockets mainly for audio, video equipment. As I do have a few prices if electrical equipment under my TV and it is hard to get to the mains switch to turn the power off to equipment I don’t want on stand-by all the time. Like everyone we want to save a bit of electric to cut down bills and even at a few watts over a year this can add up to a bit. So using a remote switch are great for use where you can’t get easy access to a socket to turn of what ever electrical equipment you need. All these remote type sockets do have a maximum rating this seems to range from 2500w to 3200w, so you can connect a fair few devices to the unit without overloading. They do have a maximum use distance ie the distance between the remote and the socket, this can range from 20 – 30 metres, remember the figures normally given by the manufactures is in line of sight without any obstacles in the way ie walls, cupboards etc. So this range can vary depending on where your socket is. To program these devices is really simple, though this does depend on the make of the remote sockets. The older ones I had you had a dial on the back of the socket with three sections separated into four frequency’s so you just set the socket to the corresponding number in the remote, the set a frequency and you are set. 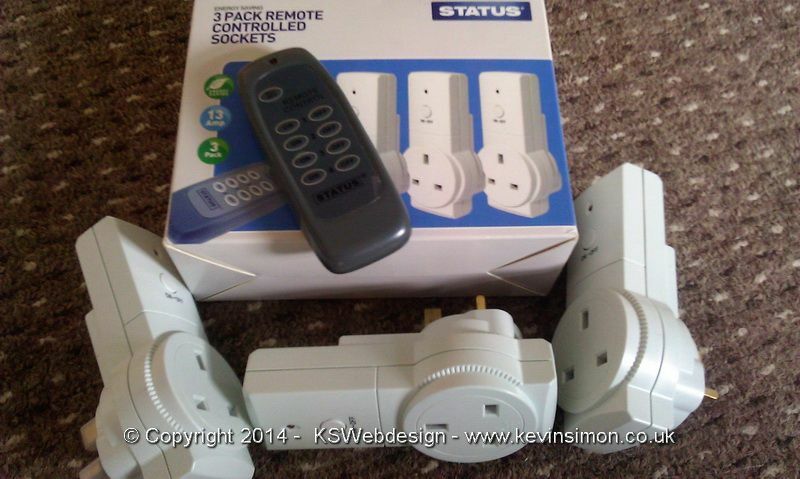 The new ones I got made by Status are self learning, you just plug in the socket and the light on the socket will flash every second then you just press one of the power buttons on the remote for more than two seconds and then the socket will then learn the code. You can also setup different sockets to the same power button number on your remote, which is great if you want to say control two lamps in different parts of your one room from just one power button. I have one setup for the main electrical devices for the TV that didn’t want in standby which includes TV, Xbox 360, wii & hard drive, PS3, nowtv steaming box and surround sound system. The second one controls mood lighting in the living room consisting of 2x LED twig lights, fire glow, and glitter lava lamp. The third one controls lighting in a display unit and also a plasma ball, as to turn this might on the socket is really inaccessible. So these things are great for turning power off if you can’t get access to plug socket switch or as well if yummy are lazy and can’t be bothered to get up to turn on a lamp etc 🙂 Because they work on a radio frequency they still use a small amount of power to operate, as they have to monitor the radio frequency for signals, I have just got a power monitor so will update this post when I know approximate running cost.